Yesterday I managed to get the snowflake pillars completed and a few quick photos posted but I didn't have time to assemble the DIY photos. It was my first priority this morning. This project was quick and easy with a wonderful final effect. I used a Silhouette Cameo but it could be completed (maybe even more quickly) without. This is the second project in my series of replaceable collars for my glass pillars. 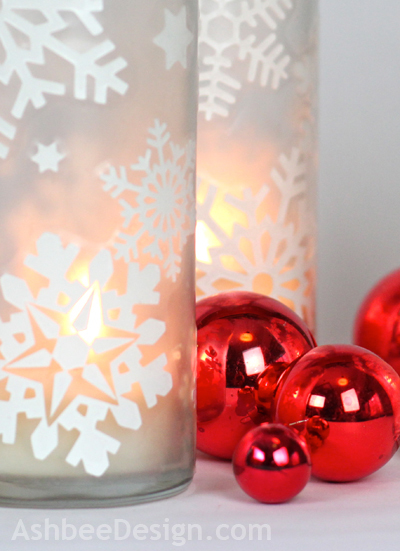 I love decorating them for the season but I don't want to have to store multiple sets, one for each holiday. Instead, I have been working on a series of removable cuffs. My first was the autumn one with the leaves. I did just slide those off, wrap them with tissue and pack the collars away. I hope I'll be able to use them again. On to those same glass cylinders I created a snowflake cuff for the winter season. And as promised, here is the directions so you can make your own. I started by doing a Google image search of snowflakes. I downloaded the ones that were clear black and white shapes. I collected five different ones. I opened the images in Preview (Mac) and saved them as jpg images. I opened the image in the Silhouette software. I traced it use the Silhouette Trace Tool, turning off the high pass filter option. I had the Silhouette machine cut the snowflakes. If I were making my own snowflakes, I would use tissue paper and cut them by hand using scissors. 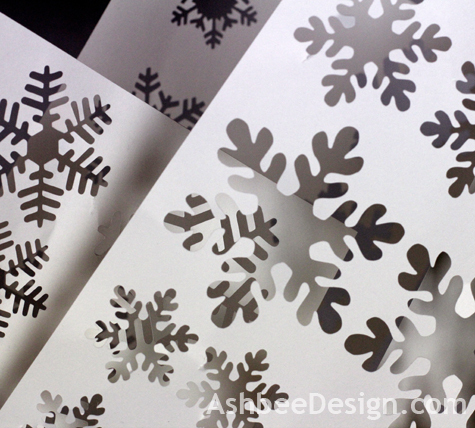 There are many sites with directions on how to cut 6-sided snowflakes. Here is a link to one by Martha Stewart. 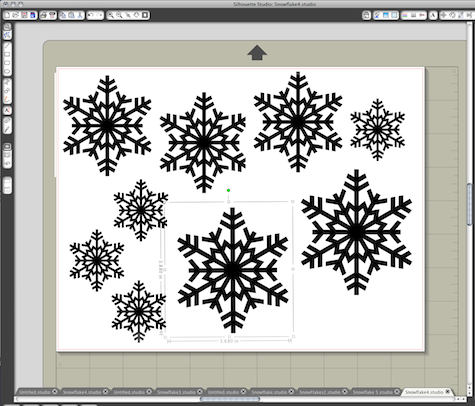 I repeated the above steps with 5 different syles of snow flakes. Cut a piece of clear Contact paper large enough to wrap around your glass cylinder (mine required 11 3/4 ") and to go up about 2/3 of the height. 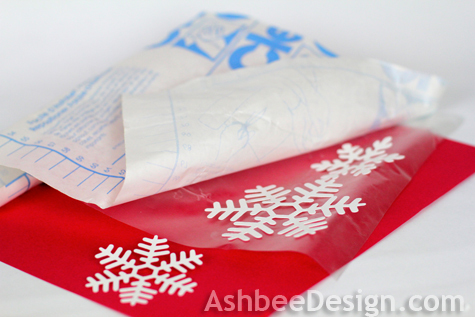 Peel back the backing and start attaching snowflakes to the sticky side. Arrange them randomly varying both the style of snowflake and the size. 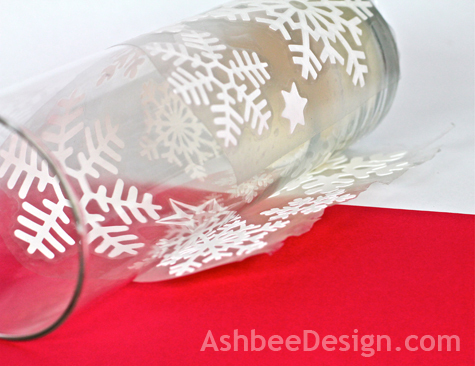 If using tissue paper you can overlap them to create a layered effect. 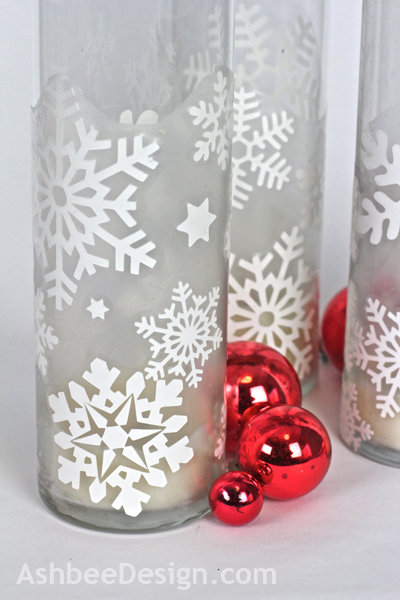 After the Contact paper is covered (not completely, leave some spaces) with snowflakes and the backing is totally peeled off, roll the contact paper onto the cylinder, lining up the bottom edge. Allow the contact paper to adhere to the glass. 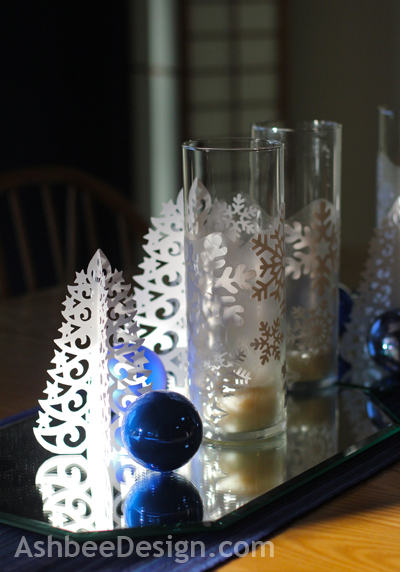 Add it to other items to make an attractive centerpiece for your holiday table. And have a wonderful holiday feast! My hope is, these will peel off when it is time to change. I did successfully unpeel one today, but we'll see if that changes with time. One more thing. I loved the leftover scraps from the cutting of the snowflakes. I had to save them and photograph them! 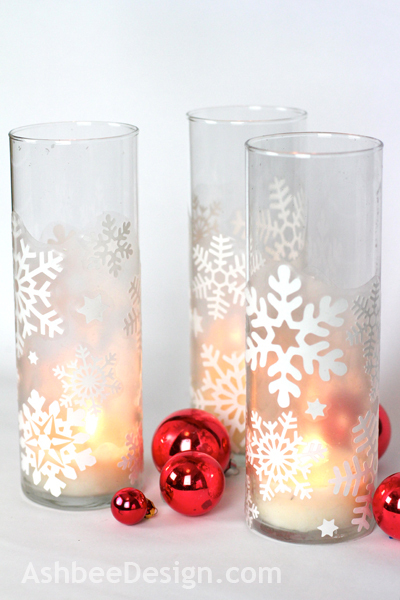 These are incredibly simple but so pretty. Thank you for taking the time to post a tutorial. Using the clear contact paper to make sleeves is genius! I expect I'll make a variety of these for different holidays through the year. 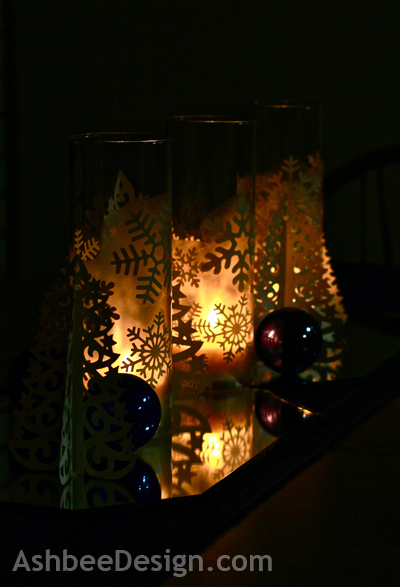 The contact paper diffuses the candle light in a very pretty way.